Save the file to your Desktop. When the installer has been downloaded you should see it file on your Desktop. The installer name has the version number included. The higher the number sequence the more recent the installer. 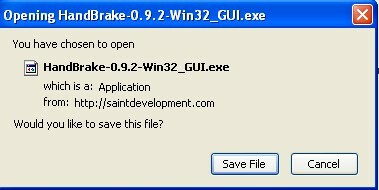 The file I downloaded is named "Handbrake-0.9.2-Win32-GUI.exe" so it is version 0.9.2. If your version is newer the number will be different. Find the file on your Desktop and double-click on it. All the screens for the installation can just be left with the default settings but I will look at them one by one. This is the license agreement. If you do not accept the agreement then the installation process will quit without installing the software. So, it is best to click on "I accept the agreement" and then "Next >". When the process is complete click on "Finish" to start using Handrabke. You should see Handbrake appear as below. 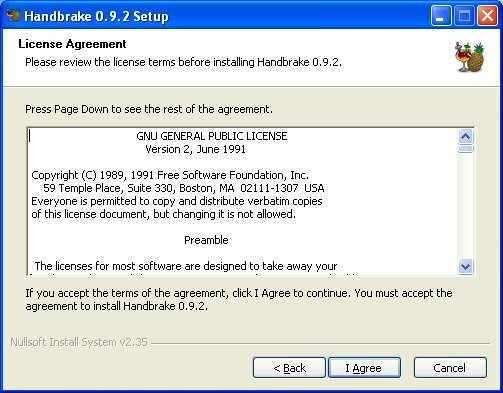 You may want to investigate basic use of Handbrake to continue. 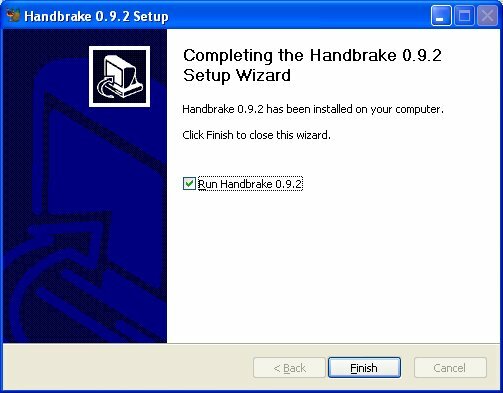 There is a trick to installing Handbrake on Ubuntu...Either you do it the hard way - using a terminal...or you do it the easy way - mostly within Firefox...we will do it the easy way. Before you start you must check that you have sudo access. This means that you have to have the privileges to implement superuser or root actions. If you are working on your own computer then you will have this access. If you are working on a shared machine that someone else set up then you might not have this level of access and so you should ask the person that owns or administrates the computer to give you sudo access. This method uses the Firefox browser, so make sure you follow these setps using Firefox. Firefox is the default browser for Ubuntu. First we must download the binary - a 'binary' is another word for 'executable'. Both these terms are really another word for 'program' or 'software'. For command line programs we usually refer to 'binaries' because it sounds geekier. Choose the "Command Line Interface (i386 Binary)" download link. When you find this, click on it and the download window will appear. You have downloaded the installer but it is in the form of an archive. An archive is a container of files that have been compressed to make the total file size smaller. Often files are compressed like this to ensure speedy downloading. We need to decompress the archive. Normally in Linux this is done using the 'terminal' - this is fast and efficient if you know how. If you don't know how then it can be confusing. So we will look at a far simpler way to do this which is just as quick. 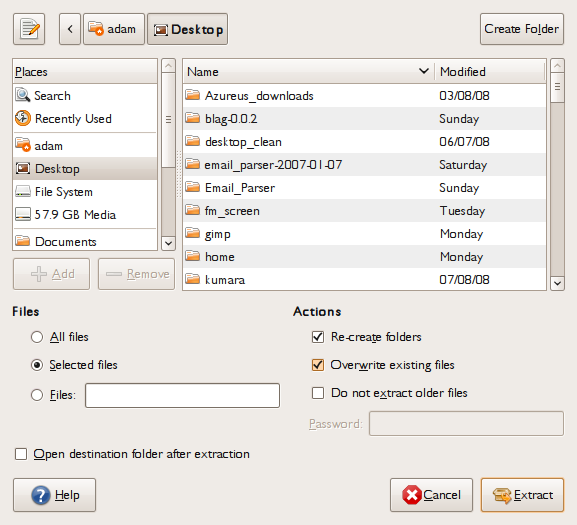 The above window is actually an archive manager program that Ubuntu uses called File Roller. 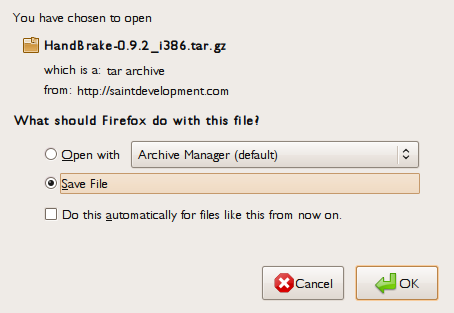 Firefox can automatically open File Roller like this when the downloaded file is a type of archive. Choose where you wish to extract the file - do tis by clicking on the folders in the file browser to find the location for the file and then press "Extract". I have extracted my file to the Desktop. Now we need to copy this file to the place where all the binaries are stored on your operating system. To do this you must first open a terminal. Now...starting a shell...what is a 'terminal' you might ask. Well, inorder to issue commands we have to use an application called a terminal. It can also be referred to as a 'shell' or simply a 'command line'. Ubuntu refers to it as a 'terminal' so we will stick to that terminology. 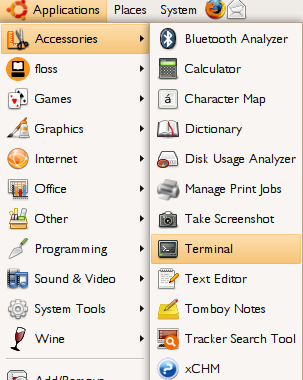 The terminal is a very powerful application. From it you are pretty much master of the Linux Universe. Want to make a new folder? Its easy from tusing commands in the terminal...want to whipe out your entire Operating System?...no problems, one short command will do it (but for your own safety I aren't going to tell you which). Yours may look a little different. Don't worry, as long as it almost looks the same you are ok. Now, you are located in your 'home' directory. When you start a terminal it is always in the home directory. By this I mean that any command you will now issue will be enacted 'from' the home directory. Don't dwell on this too much, if you don't understand it then the understanding will come after using the terminal a little. All binary files are stored in one of two places : the 'bin directory and the 'sbin' directory. The later is for storing binaries that are used by the root user (also know as the superuser). We wish to use the 'bin' directory. You must work through the possiblities of finding the binary on your computer. 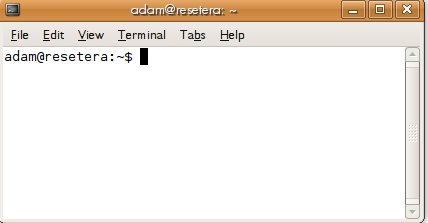 You may wish to read more about the Linux file system and the cd command to be able to do this. You will then be asked for a password. Type in your own user account password (the password you used to log in) and press return. If you have the correct rights to execute commands as sudo the file will be copied to bin. If you do not have the right access priviledges you need to ask your local Ubuntu guru how to get them. You should see a whole lot of information appear telling you how to use Handbrake on the command line. When you start Handbrake you should see the screen below. 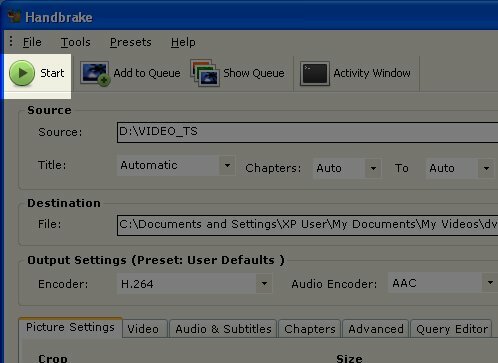 Now I will talk you through the most basic use of Handbrake -using Handbrake to convert a DVD into an Internet distributable mp4 file. 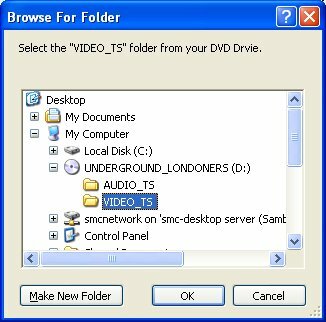 Firstly you should insert a DVD disk into your computer. Then you should click on the Browse button next to the part of the screen that says "Source". After clicking this button a window should appear as below. 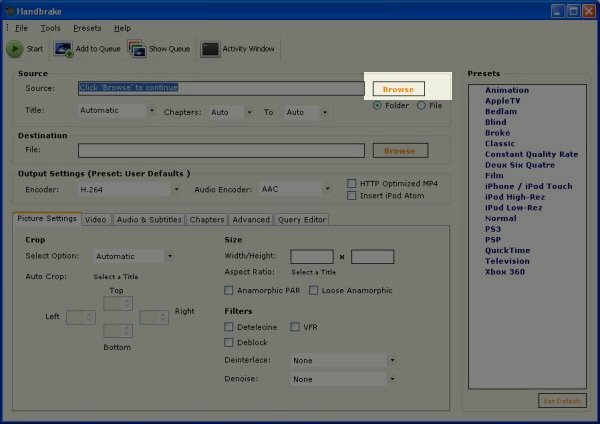 The above window make take a little time to disappear as Handbrake analyses the structure of the DVD. You may notice a section under the source window that lists the "Title:" and "Chapters:" If you want you can leave this section untouched, as the default. This will encode all the information on the DVD disk. You may want to choose only one 'Title' (usually a self contained film on the DVD) or select only certain 'Chapters' (normally a section of a film created to make DVD navigation easier). If this is the case you can select Titles and Chapters in the "Source" section of the default Handbrake window. You can see the length of the different titles (film) so you can identify which one you want to select. Now we will see a file browser. Select a directory on your computer that where the mp4 will be created and stored. Give the file name in the 'File Name' box and leave the default setting of mp4 in the 'Save as Type' box. 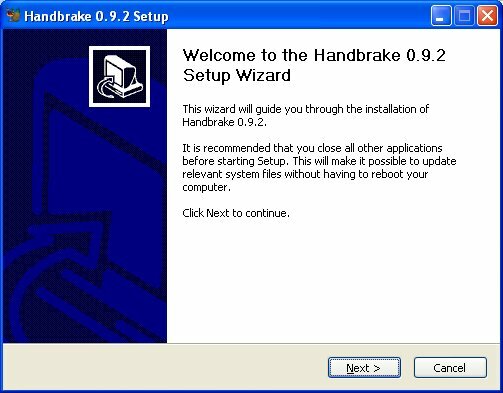 You can change this to another file format if you want to, but for this basic introduction to Handbrake we will leave it at mp4. 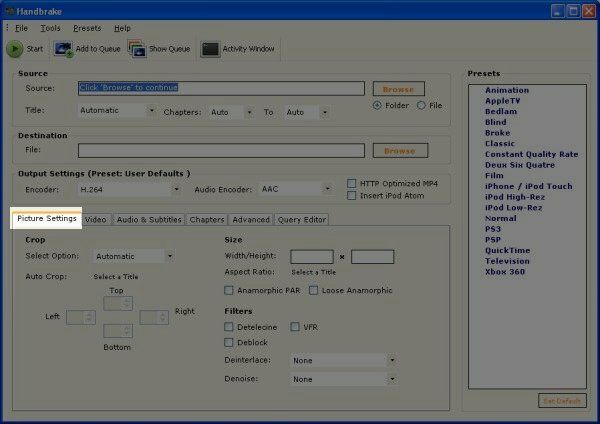 Then you can start the process of encoding the DVD to Mp4 file by clicking on the big "Start" button at the top left of the screen, shown below. When the encoding process is happening you should see a black screen telling you the process is happening and how long it will take. If you haven't seen this kind of window before it is know as the DOS Window or command line. When the process has finished you should use a programme like VLC player to test the file you have created. 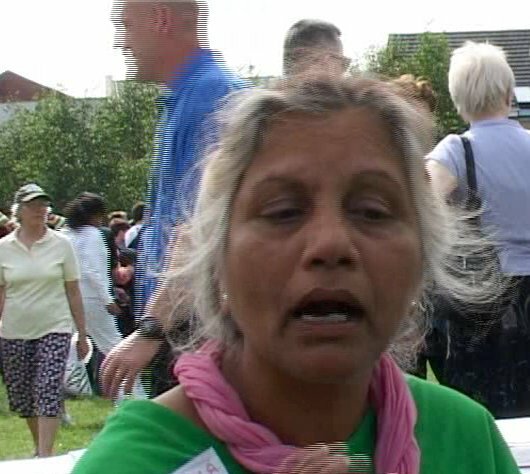 You may wish to upload it to the Internet to a video sharing service like Archive.org or Blip.tv. 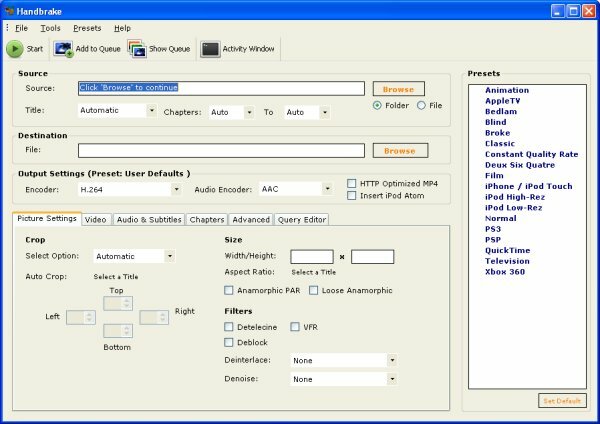 Handbrake has some presets for video and audio settings which are useful for encoding for specific devices or for specific types of video. To test this out, after you have selected your source and destination file, select the "iPodLowRez" setting from the right of the default screen. You will see that this sets a size automatically and if we click on to the video tab we'll see that a default bitrate of 700 kps is applied too. These presets are useful for preparing video for an ipod. When using Handbrake you can set a Source Disk and an output filename and click "Start" and Handbrake will automatically create a suitable file of abut 10 MB per minute. This is te default. However you may want to change the Picture Settings to specify more acurately what kind of file you would like to create. The picture settings section is at the bottom of the default screen of Handbrake. You should be able to see it by default when you open up the application. However if you have altered other settings then you will need to click on the Picture Settings tab as show below. If you don't enter a size for Picture Settings then Handbrake will try to work out the most appropriate size. I would reccomend not changing the size here as doing so creates unpredictable results. If you do enter a size then only enter the width that you want the video to be, and let Handbrake work out the appropriate height - this will save you having to calculate this manually. Handbrake recognises the shape of the DVD and it illustrates this in the Size section below the width and height. The shape is know as the Apsect Ratio. In the above example it shows ('1.78' which is also known as 16:9 and is a kind of 'wide screen'. 1:33 also known as 4:3 is normal old TV shape. Adding a deinterlace filter is often one of the most overlooked steps when encoding video for the internet. Getting it wrong leads to badly encoded video files. If you have created the DVD yourself then it is likely that your video will be interlaced. If you are not sure what that means then you should look at the next image. You can see jagged lines on the screen where ever there is motion. These lines are caused by interlacing. If we don't add a filter then the file we create will be much more blurry than it needs to be. You can then adjust the other Handbrake settings to your needs before clicking on "Start" to encode your video. You may want to change the Video Settings to have a file of a more exact output type. The Video Settings section is at the bottom of the default screen of Handbrake. You should be able to see it by clicking on the Video settings tab as show below. You can then make some alterations to the video encoding options. For example you can set at Target Size for a video in Megabytes or as kilobits per second (kbps). You should have received a copy of the GNU General Public License along with this documentation; if not, write to the Free Software Foundation, Inc., 51 Franklin Street, Fifth Floor, Boston, MA 02110-1301, USA.